SMA, SB5000TL-US-22, Grid Tie Inverter with Secure Power Supply, 5000 watt 240v. THIS INVERTER HAS SPS! 1500 watts of power to a dedicated outlet with a switch! When the power is out, as long as the sun is still shining you can still have up to 1500 watts of devices plugged in to the dedicated outlet. Check out the video: SMA SPS Video. 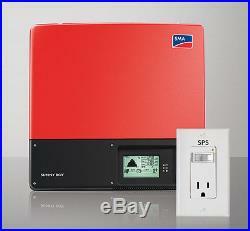 SMA Sunny Boy SB5000TL-US-22 Grid-Tie String Solar Inverter Made in the USA. Setting new heights in residential inverter performance. Its transformerless design means high efficiency and reduced weight. Maximum power production is derived from wide input voltage and operating temperature ranges. Multiple MPP trackers and OptiTrac? Global Peak mitigate the effect of shade and allow for installation at challenging sites. The unique Secure Power Supply feature provides daytime power in the event of a grid outage. High performance, flexible design and innovative features make the Sunny Boy TL-US series the first choice among solar professional. 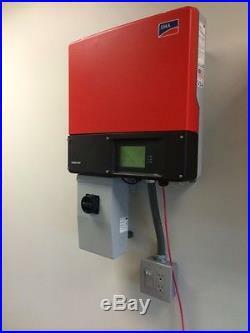 The Sunny Boy 3000TL-US / 3800TL-US / 4000TL-US / 5000TL-US / 6000TL-US /7000TL-US / 7700TL-US are transformerless inverters, which means owners and installers benefit from high efficiency and lower weight. A wide input voltage range also means the inverters will produce high amounts of power under a number of conditions. Additionally, transformerless inverters have been shown to be among the safest string inverters on the market. An industry first, the TL-US series has been tested to UL 1741 and UL1699B and is in compliance with the arc fault requirements of NEC 2011. Global Peak, SMAs shadetolerant MPP tracking algorithm, quickly adjusts to changes in solar irradiation, which mitigates the effects of shade and results in higher total power output. And, with two MPP trackers, the TL-US series can ably handle complex roofs with multiple orientations or string lengths. An extended operating temperature range of -40 °F to +140 °F ensures power is produced in all types of climates and for longer periods of time than with most traditional string inverters. One of many unique features of the TL-US residential series is its innovative Secure Power Supply ability. With most grid-tied inverters, when the grid goes down, so does the solar-powered home. SMAs solution provides daytime energy to a dedicated power outlet during prolonged grid outages, providing homeowners with access to power as long as the sun shines. As a transformerless inverter, the TL-US residential series is lighter in weight than its transformer-based counterparts, which makes lifting and transporting the new inverter easier than before. A new wall mounting plate features anti-theft security and makes hanging the inverter quick and easy. A simplified DC wiring concept allows the DC Disconnect to be used as a wire raceway, saving labor and materials. Rated Power Output [W]: 5000. Length [mm (in)]: 519 mm (20.5 in) Without the DC Disconnect. Width [mm (in)]: 490 mm (19.3 in) Without the DC Disconnect. Depth [mm (in)]: 185 mm (7.3 in) Without the DC Disconnect. Weight [kg (lb)]: 24 kg (53 lb) Without the DC Disconnect. Inverter Type: Grid-Tie String Inverter. Maximum/Peak Efficiency [%]: 208V:96.8%/ 240V:97.1%. Transformer / Transformerless: Transformerless. DC Voltage [V]: 600. MPP voltage range [V]: 175 – 480V. DC voltage / start voltage [V]: 125 / 150 V. Number of DC String Inputs (Inlets): 2. Number of MPP Trackers: 2. Input Current per MPPT [A]: 15. AC Power [W]: 4550W at 208 VAC / 5000W at 240 VAC. AC voltage range [V]: 208V: 183-229V / 240V: 211-264V. AC grid frequency [Hz]: 60. Output current [A]: 22A. Nominal AC Voltage [V]: 208V / 240V. CSI-Approved Built-in Meter: Yes. Ambient Temperature Range [Â°C(Â°F)]: 40 °C… +60 °C 40 °F… Communication: RS485 / Webconnect ZigBee. Compliances: UL 1741, UL 1998, UL 1699B, IEEE1547, FCC Part 15 (Class A & B), CAN/CAS C22.2 107.1-1. AC grid range [Hz]59.3-60.5 Hz. Recommended PV power (at module STC): 5300. At Modern Day Survival we are dedicated to our service for you! If for any reason there is an issue with your order we will contact you right away. Samuel Maggard is the CEO and founder of Modern Day Survival, an active Ecommerce website and blog community which sells more than 250 thousand products in various categories. He is responsible for the company’s overall vision and strategy as well as day-to-day operations. Since the beginning, Sam has focused on simplicity and inspiring others through solving problems with thoughtful product design. As a result, Modern Day Survival brings solutions to a wide range of people. From the gardener to the prepper. Sam grew in the Ozark Mountains in Southwest Missouri. The only son of a family that owned a water well drilling and pump service company. With extensive background of the business and the youngest person to withhold a pump installers license in the state of Missouri; Sam takes that knowledge to the custom designs and projects that Modern Day Survival offers. Linda Plunkett is the company administrator for Modern Day Survival. She is orginally from Peru, Indiana, and moved to Minden, Louisana when her father got transferred for work. She met her husband of 39 years now, during her sophomore year of school. They got married a year after graduation. They have 2 children, son and daughter whilst going to college and graduated with an accounting degree. Linda and her husband enjoy doing things outside. They have a small farm with rabbits, chickens and goats. They got in to raising their own garden and animals; as her husband said, We were going to start living off the grid and this is what we do. Please give us a text / call if you have any questions about a product or need a custom designed solution. The item “SMA, SB5000TL-US-22, Grid Tie Inverter with Secure Power Supply, 5000 watt 240v” is in sale since Sunday, June 19, 2016. This item is in the category “Home & Garden\Home Improvement\Electrical & Solar\Alternative & Solar Energy\Chargers & Inverters”. The seller is “magga-samue” and is located in Williston, North Dakota. This item can be shipped to United States, to all countries in Europe, to all countries in continental Asia, to Mexico, BR, to Australia. SMA, SB5000TL-US-22, Grid Tie Inverter with Secure Power Supply, 5000 watt 240v. THIS INVERTER HAS SPS! 1500 watts of power to a dedicated outlet with a switch! When the power is out, as long as the sun is still shining you can still have up to 1500 watts of devices plugged in to the dedicated outlet. Check out the video: SMA SPS Video. SMA Sunny Boy SB5000TL-US-22 Grid-Tie String Solar Inverter Made in the USA. Setting new heights in residential inverter performance. Its transformerless design means high efficiency and reduced weight. Maximum power production is derived from wide input voltage and operating temperature ranges. Multiple MPP trackers and OptiTrac? Global Peak mitigate the effect of shade and allow for installation at challenging sites. The unique Secure Power Supply feature provides daytime power in the event of a grid outage. High performance, flexible design and innovative features make the Sunny Boy TL-US series the first choice among solar professional. The Sunny Boy 3000TL-US / 3800TL-US / 4000TL-US / 5000TL-US / 6000TL-US /7000TL-US / 7700TL-US are transformerless inverters, which means owners and installers benefit from high efficiency and lower weight. A wide input voltage range also means the inverters will produce high amounts of power under a number of conditions. Additionally, transformerless inverters have been shown to be among the safest string inverters on the market. An industry first, the TL-US series has been tested to UL 1741 and UL1699B and is in compliance with the arc fault requirements of NEC 2011. Global Peak, SMAs shadetolerant MPP tracking algorithm, quickly adjusts to changes in solar irradiation, which mitigates the effects of shade and results in higher total power output. And, with two MPP trackers, the TL-US series can ably handle complex roofs with multiple orientations or string lengths. An extended operating temperature range of -40 °F to +140 °F ensures power is produced in all types of climates and for longer periods of time than with most traditional string inverters. One of many unique features of the TL-US residential series is its innovative Secure Power Supply ability. With most grid-tied inverters, when the grid goes down, so does the solar-powered home. SMAs solution provides daytime energy to a dedicated power outlet during prolonged grid outages, providing homeowners with access to power as long as the sun shines. As a transformerless inverter, the TL-US residential series is lighter in weight than its transformer-based counterparts, which makes lifting and transporting the new inverter easier than before. A new wall mounting plate features anti-theft security and makes hanging the inverter quick and easy. A simplified DC wiring concept allows the DC Disconnect to be used as a wire raceway, saving labor and materials. Rated Power Output [W]: 5000. Length [mm (in)]: 519 mm (20.5 in) Without the DC Disconnect. Width [mm (in)]: 490 mm (19.3 in) Without the DC Disconnect. Depth [mm (in)]: 185 mm (7.3 in) Without the DC Disconnect. Weight [kg (lb)]: 24 kg (53 lb) Without the DC Disconnect. Inverter Type: Grid-Tie String Inverter. Maximum/Peak Efficiency [%]: 208V:96.8%/ 240V:97.1%. Transformer / Transformerless: Transformerless. DC Voltage [V]: 600. MPP voltage range [V]: 175 – 480V. DC voltage / start voltage [V]: 125 / 150 V. Number of DC String Inputs (Inlets): 2. Number of MPP Trackers: 2. Input Current per MPPT [A]: 15. AC Power [W]: 4550W at 208 VAC / 5000W at 240 VAC. AC voltage range [V]: 208V: 183-229V / 240V: 211-264V. AC grid frequency [Hz]: 60. Output current [A]: 22A. Nominal AC Voltage [V]: 208V / 240V. CSI-Approved Built-in Meter: Yes. Ambient Temperature Range [Â°C(Â°F)]: 40 °C… +60 °C 40 °F… Communication: RS485 / Webconnect ZigBee. Compliances: UL 1741, UL 1998, UL 1699B, IEEE1547, FCC Part 15 (Class A & B), CAN/CAS C22.2 107.1-1. AC grid range [Hz]59.3-60.5 Hz. Recommended PV power (at module STC): 5300. At Modern Day Survival we are dedicated to our service for you! If for any reason there is an issue with your order we will contact you right away. Samuel Maggard is the CEO and founder of Modern Day Survival, an active Ecommerce website and blog community which sells more than 250 thousand products in various categories. He is responsible for the company’s overall vision and strategy as well as day-to-day operations. Since the beginning, Sam has focused on simplicity and inspiring others through solving problems with thoughtful product design. As a result, Modern Day Survival brings solutions to a wide range of people. From the gardener to the prepper. Sam grew in the Ozark Mountains in Southwest Missouri. The only son of a family that owned a water well drilling and pump service company. With extensive background of the business and the youngest person to withhold a pump installers license in the state of Missouri; Sam takes that knowledge to the custom designs and projects that Modern Day Survival offers. Linda Plunkett is the company administrator for Modern Day Survival. She is orginally from Peru, Indiana, and moved to Minden, Louisana when her father got transferred for work. She met her husband of 39 years now, during her sophomore year of school. They got married a year after graduation. They have 2 children, son and daughter whilst going to college and graduated with an accounting degree. Linda and her husband enjoy doing things outside. They have a small farm with rabbits, chickens and goats. They got in to raising their own garden and animals; as her husband said, We were going to start living off the grid and this is what we do. Please give us a text / call if you have any questions about a product or need a custom designed solution. The item “SMA, SB5000TL-US-22, Grid Tie Inverter with Secure Power Supply, 5000 watt 240v” is in sale since Saturday, June 04, 2016. This item is in the category “Home & Garden\Home Improvement\Electrical & Solar\Alternative & Solar Energy\Chargers & Inverters”. The seller is “magga-samue” and is located in Williston, North Dakota. This item can be shipped to United States.